If you've always wanted to play the guitar, this is where your journey begins. This essential course offers you a genuine opportunity to steadily and systematically pick up guitar-playing aptitude. Start with a familiarization of popular chords and progress to incorporate basic rhythms to all-time favorite praise songs. This course will prove to be fun, achievable, and relaxing for the total beginner. * Payment for full 7-week module at $229 must be made upon online registration. Stated fees include 7% GST. Believer Music Silver Program is offered for individuals who are above the ages of 50. What's the difference between Believer Gold and the regular music programs? Believer Silver syllabus has been specifically developed for seniors in mind. Believer Music recognizes the need for a specific training syllabus for the older learning community. The lessons are paced very comfortably with allotted time for mutual interaction within Believer Music's special blend of worship and musical devotion. This step-by-step course is designed for total beginners who have absolutely no prior knowledge in music or the guitar. Individuals who attended other beginner courses but are still unable to play confidently and effectively are advised to join this Beginner Module. What you are going to learn here is going to be fun, powerful and practical for your personal worship. Adopt a heart of worship right from the start. Conducted in small groups (i.e. 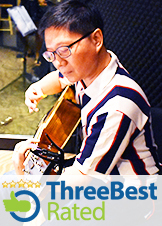 6-8 persons), the 1 hr per week sessions include: INTRODUCTION to the guitar and its role RHYTHM Orientation - Strumming and Style HARMONY Orientation - Chord & Progressions SONG Application and Techniques BUILT-IN Weapons - Enhanced Techniques INTERACTIVE Music Exercises (Ensemble style) WEEKLY E-Newsletters. You will learn more than strumming rhythm and chords. You will learn to take steps to worship God effectively on the guitar. I received classical guitar lessons previously. Is it still applicable in this course? It is applicable because you have learnt to listen to yourself as you play and follow general timing. Here, you will learn how to strum effectively in a variety of styles. You will be able to decide the most appropriate rhythm to use as well as play the song in more than one fashion. The course is fairly demanding and requires concentration and time-allocated practice on your own. Nevertheless, what you are going to learn here is going to be fun and practical. All studios are fully equipped with practice guitars. Our Training Centres are conveniently located at International Plaza - Flagship (beside Tanjong Pagar MRT station) and One Commonwealth (beside Commonwealth MRT station). You'll get to meet people who share the same passion. Learning to play a musical instrument is highly rewarding because it leads to growth in a music-spiritual dimension. Learning to play the guitar is more than fun. It's life-changing. We all know of people around us whom we think have successfully learnt to play the guitar reasonably well. With practice, this skill will stay and enrich not only your lives but also the lives of people and family around you (and generations to come). For many of us who are just starting to pick up this unique skill, believe that the journey is well worth it. Folk and Classical Guitar...What's the difference? A folk guitar uses steel strings while a classical guitar uses nylon strings. The Folk guitar's neck is narrower which makes playing easier, and no, it doesn't hurt as much as you tell yourself! With proper stringing gauge, beginners will feel only a pinch. The folk guitar is made especially for strumming and you'll hear more varied tones as compared to a bass-mid sounding classical guitar .The feel achieved during strumming is probably more rewarding compared to a classical guitar.